One of our classic range of year-round sleepwear essentials, the Royal 40 Col C dressing gown is made from a medium-weight pure cotton men's dressing gown with a satin stripe design, featuring a shawl collar, breast pocket and two side pockets. It is a quintessential gown design that will never go out of style. Featuring a polka dot pattern and finished with contrasting white piping, this is an elegant gown for the discerning gentleman. The Royal 40 was worn by Alec Baldwin's character in Woody Allen's Blue Jasmine. 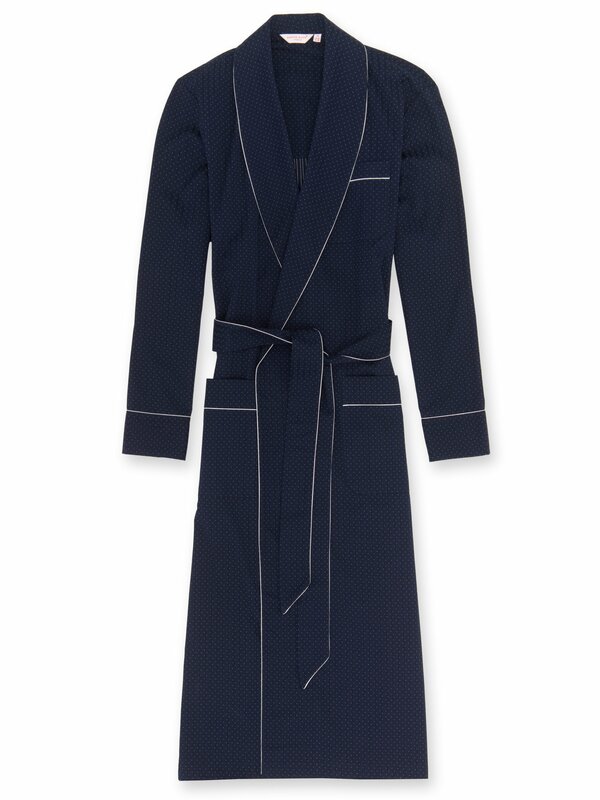 The Derek Rose dressing gown features a classic, generous cut and length, for both elegance and comfort. Made to a specification first developed by Mr Derek Rose decades ago and refined over the years, the gown features a traditional shawl collar, rifle cuffs and breast and side pockets. This garment has also been fully piped by hand. In the image, model is 6'1" / 186cm tall with waist size 32 and chest size 39. He wears a size M.